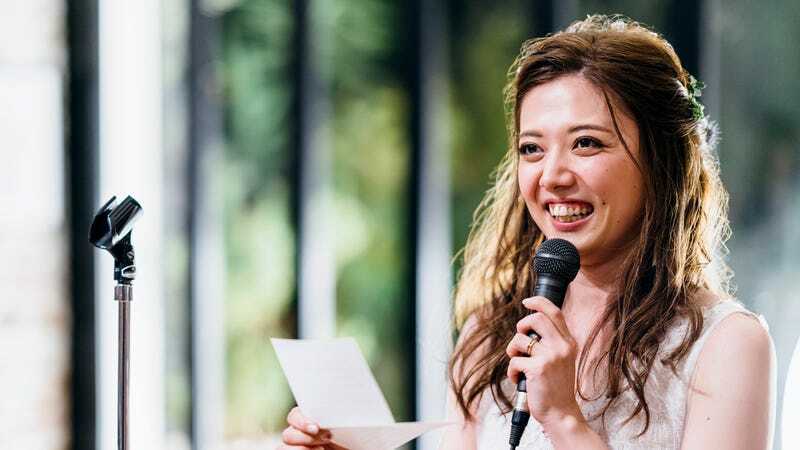 CLEVELAND, OH—Relying completely on the acclaimed poet’s platitudes on life, love, and loss, anxiety-ridden wedding participant Kelsey Guzman based the majority of her maid of honor speech this week on random Maya Angelou quotes strung together on extremely thin pretenses. “I thought Kels would be okay when she opened the speech with a workmanlike ‘As the great Maya Angelou once said…’ but pretty soon it became obvious she had no idea what she was doing,” said bridesmaid Rachael Klein, who watched with the rest of the guests in mounting discomfort as Guzman clumsily illustrated her friendship with the bride by reading several entirely unrelated and nonsequential lines of “On the Pulse of Morning.” “Just when you think she’s going to say something nice and genuine about Jessica, she panics and dives right back into Angelou. In fact, if you didn’t know the bride at all, you’d be really impressed with the resilience and courage she displayed while growing up black in the Depression-era south. Oh, God, did she just say ‘Still, like dust, Jessica’s love for Matthew rises?’ Yikes.” Guzman then concluded her speech with yet another Maya Angelou quote, which she wrongfully attributed to Toni Morrison.